And also California Archives Month. Each year California produces an Archives Month poster. This year's poster celebrates 150 Years of California’s State and National Parks. The photograph is from the Annie R. Mitchell History Room, Tulare County Library collection. "Archivists bring the past to the present. They are records collectors and protectors, keepers of memory. They organize unique, historical materials, making them available for current and future research." But what archival material does the San Lorenzo Valley Museum hold? Hundreds of photographs, letters, scrapbooks, oral histories, newspapers, maps, posters ... the list goes on. Each of these require careful storage to preserve them for future generations. Purchasing appropriate storage can be expensive. We usually purchase our archival material through Gaylord Archival. Our membership with the California Association of Museums gives us a discount, but on average a single archival box exceeds $10, depending on the shape and size. Just take a look at the cost of 20"x24" buffered acid-free tissue - over $44 for just 100 sheets. But what does it mean to be "buffered" and "acid-free"? There is a good explanation here. Buffered tissue (usually with the buffering agent Calcium Carbonate) helps to neutralize acids and prevent acid migration to the objects that the tissue is used to protect. Buffered interleaving tissue extends the life of paper, photographs, some textiles, and artifacts. We use buffered tissue to interleave the pages of photograph albums and scrapbooks. Here is a letter from the collection dated November 1880. 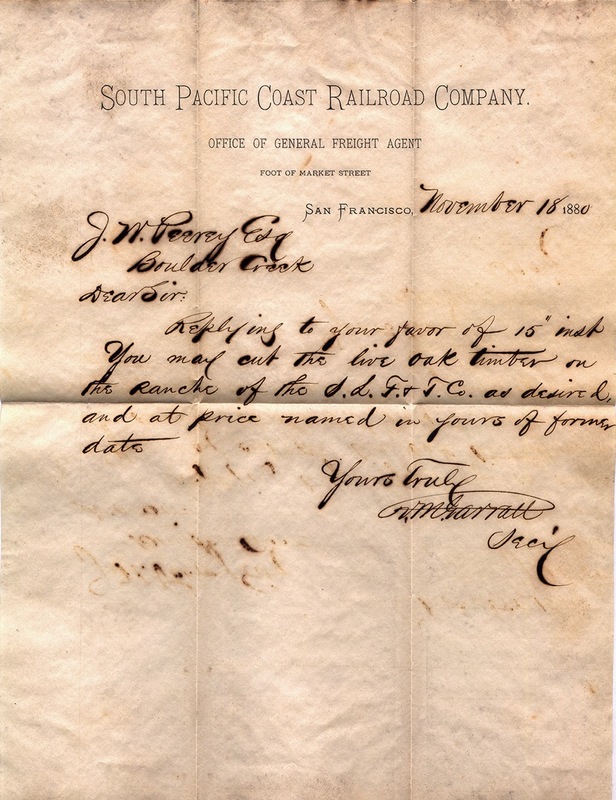 The letter is from the South Pacific Coast Railroad Company to lumberman, and founder of the town of Lorenzo, Joseph Peery. Replying to your favor of the 15th inst. You may cut out the live oak timber on the ranch of the S.L.F.&T.Co. [San Lorenzo Flume & Transportation Company] as desired, and at price named in yours at former date. Copyright (c) San Lorenzo Valley Museum 2013. Travel theme. Powered by Blogger.